On 2 December 2014, BRE published A technical guide to district heating (FB 72) by Robin Wiltshire, Jonathan Williams and Paul Woods. District heating (DH) allows centralised heat sources to be connected to distributed heat consumers. Typically it comprises; one or more energy centres, the pipe network, and connections to consumers. The high heat loads compared to individual, independent systems allow economies of scale and smoother demand, leading to more efficient operation of the energy centre. It also allows the use of heat sources that would not be viable at a smaller scale. FB 72 presents comprehensive information outlining system and component design, operation and maintenance. The 54 page guide is largely an update of Good Practice Guide 234, Guide to community heating and CHP, but it has been extended to emphasise the importance of other low-carbon sources of heat other than combined heat and power (CHP) including thermal renewable energy. 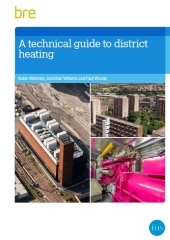 The guide focuses on technical rather than financial issues and will be useful for anyone involved in the technical aspects of district heating networks, whether on new or refurbishment schemes. Relevant standards, codes of practice and publications. Municipal energy - briefing sheet.